• Introduction to Logic Families. Section 3.1 Power, Speed and Compatibility. • Scale of integration, SSI, MSI, VLSI. Section 3.2 How Logic gates Work. • CMOS, TTL and ECL operation. • Capacitance and Propagation Delay. Section 3.3 Logic IC Parameters. • Logic 1 and Logic 0. Section 3.5 Logic Families Quiz. • Test your knowledge of Logic ICs. In this module, the differences and similarities between the various families of logic ICs available are described, along with their important operating conditions. Logic 1 and Logic 0 are a bit more complex that 5V and 0V because these digital ICs are really little analogue circuits posing as ‘Digital’. A sort of sheep in wolves clothing! Find out how logic gates actually work, and learn about the parameters that govern how the chips should be used. Special versions of the basic logic gates are also explained, such as Schmitt gates, open collectors, and buffers. 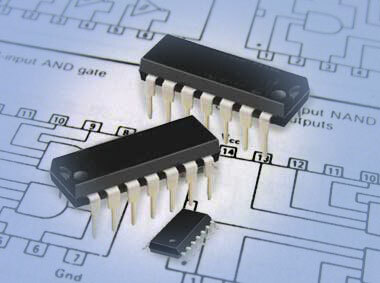 The 74 series of logic ICs introduced in this module, has been the backbone of digital electronics for about the last 50 years. Although nowadays they have been replaced in many applications by bigger, faster smarter chips, the 74 series families continue to play an important role in electronics, and learning about them is a sound basis for understanding the vital basics of digital electronics.